Ice Never Taste So Good. I love it when Jewelry and Fashion Designers collborate to create unique, beautiful pieces that are only a few of us can get our hands on. 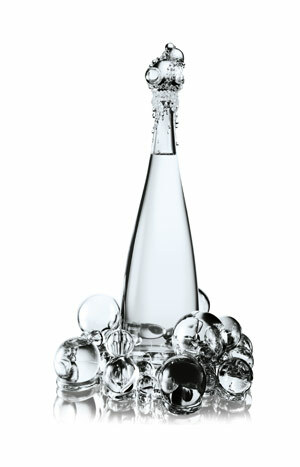 So when Baccarat, Jean Paul Gaultier, and Evian decided to give us something new, of course who is going to refuse. With only five made worldwide, The New York Bottle has crystal bubbles gathering at the top and base. If you didn’t get a glimpse of at Bergdorf Goodman’s Fifth Avenue windows last week, the glass water bottle is now at Soho Grand then off to the Buddha Bar, before heading back home to Paris. Hopefully this turns into a tradition. 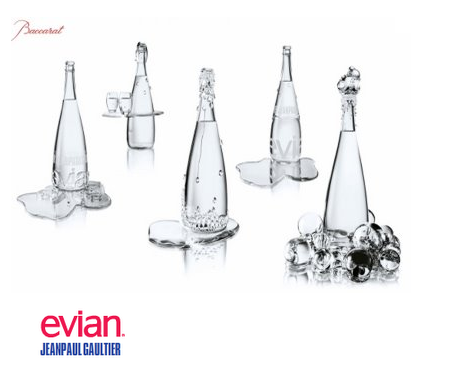 Last year Evian worked with Christian Lacroix to create a haute couture bottle. Click here to view.